So you’ve gone ahead and purchased canned salmon, deciding that you were going to add this delicious fish to your diet in a way that’s both convenient and economic. 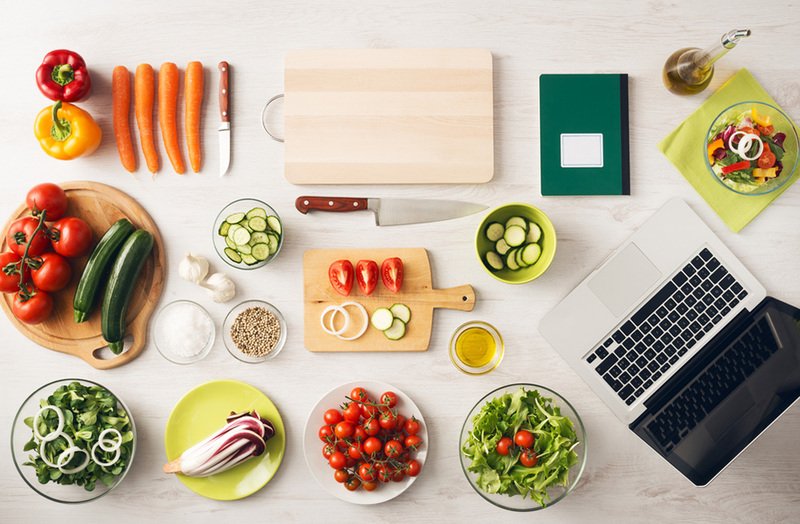 You researched the brands and the different canning methods, you looked through your favorite grocery store until you found what you needed; you bought the canned salmon, took it home and now you’re not sure what to do with it. Yup, you better believe I’ve been there. While adding some lime juice and maybe even some mayo and eating it directly from the can is a possibility worth exploring, there are many easy and delicious things you can do, today I’m sharing with you how to make salmon patties from canned salmon. Once you’ve acquired all the necessary bits, cooking salmon patties is a piece of cake and it should take you around 30 minutes, including preparation time. 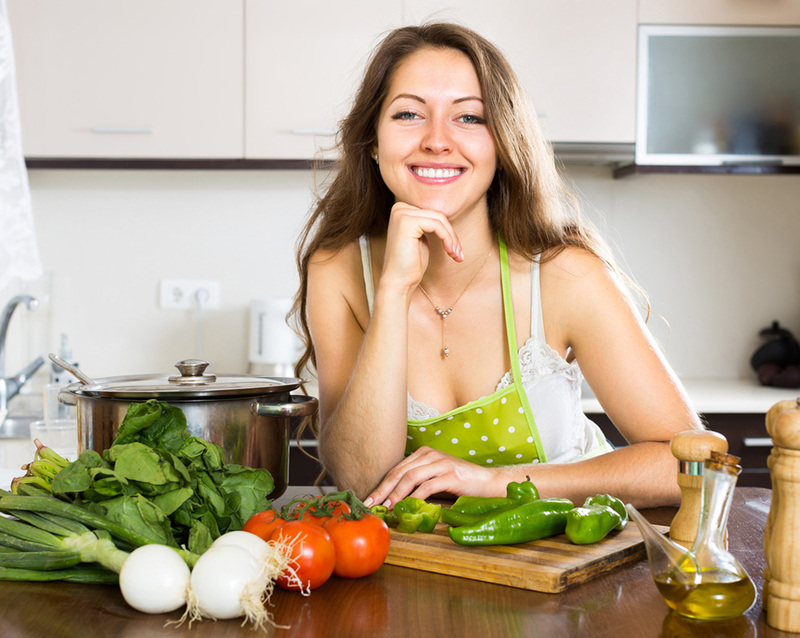 Finely chop your onions and peppers using a sharp kni﻿﻿fe and a cutting board to protect your counters. Remember that this will go inside the patty, so the pieces need to be really small. Some brands of canned salmon have canned whole pieces of the fish. While this is perfectly good, this also means there’s a chance you’ll find a bone or two so drain your salmon with the help of a strainer and carefully look for bones that need to be removed. If you’ve purchased a brand of salmon that has no whole bits then simply strain it. Break both eggs in a small bowl and beat them thoroughly until both whites and yellows have mixed completely. In your large bowl, mix all your ingredients. Start with the flour and seasonings, mixing them thoroughly before throwing in the eggs, bread crumbs, pepper and onions. 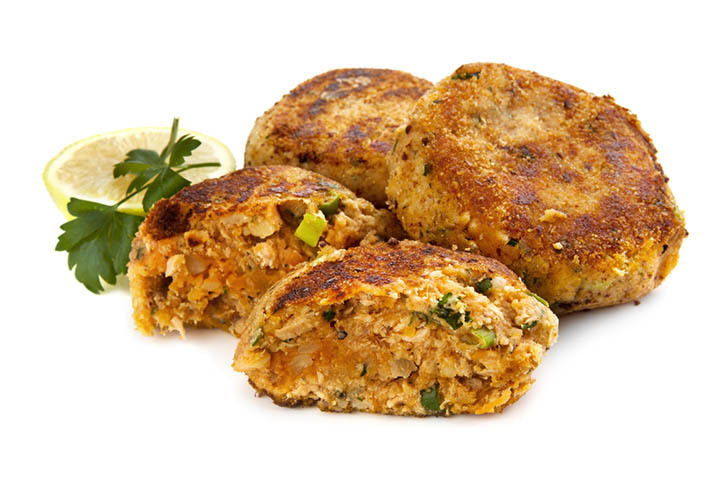 Once the ingredients are completely mixed, toss the salmon in there as well and stir together until the mix becomes solid enough to form patties with your hands. Coat the palm of your hands with all-purpose flour to keep the patties from sticking to your skin and grab some of the mix. Roll the mix into a small ball before flattening it with your hands. You can choose how thick or flat the patties will be during this step. You should be able to get 8 patties out of this recipe but you can create more or less depending on how thick you want them. Spread the rest of your bread crumbs on a flat dish and coat all patties on both sides by pressing them against the crumbs. Place your pan over medium flame and wait for it to be hot. You can check if your pan is hot or not by tossing a couple of droplets of water on it. Once the pan is hot, put oil in it until it completely covers the bottom. There might be some splashing so be careful with that. Once the oil is hot place the patties on the pan. You can put more than one in the pan if there’s enough space, just leave enough room between them to avoid any sticking. Let one side brown (about 5 minutes) before flipping the patty and leaving the other side to brown. In total, it should take around 10 minutes for each patty. 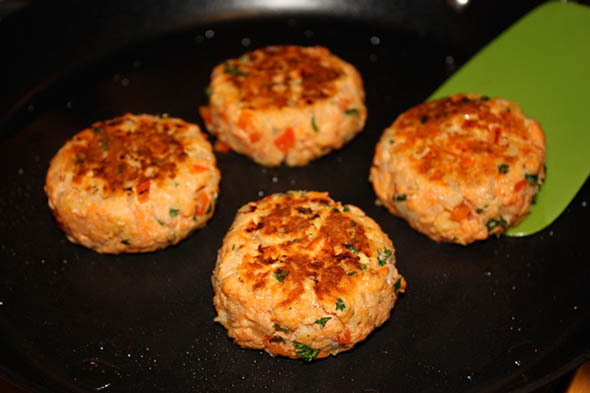 Carefully take out each patty from the pan and hold them above them for excess oil to drain. Once that’s done, place them on paper towels and gently pat them dry so the towels absorb all the excess oil. Careful when eating them, as the insides will be quite hot even after the outsides have cooled. While you can eat the salmon patties on their own or with some mayo if you feel like it, I love adding garlic sauce to them. The recipe is really simple so I’m going to share it with you. - ¼ cup of mayonnaise, whole or light. - 2 garlic cloves, shaved and pressed. - Heavy cream, for texture. Whisk the mayo, the crushed garlic and the lemon juice until perfectly blended. The cream is added in order to thicken the sauce so this depends entirely on your preference. Add spoonful and whisk with all the other ingredients, then check for consistency. Repeat the process until the sauce looks exactly how you want it to look. Place the sauce in a fridge safe container and cover it with a lid, then place it in the fridge for at least 15 minutes. The sauce can stay there for up to a week, just keep in mind that the longer it stays there the milder the flavor will be. - Adding a touch of Sriracha or other hot sauces to the cream can give it a slightly spicy flavor. - If you want more bread crumbs on your patties you can always dip them in egg whites before coating them. 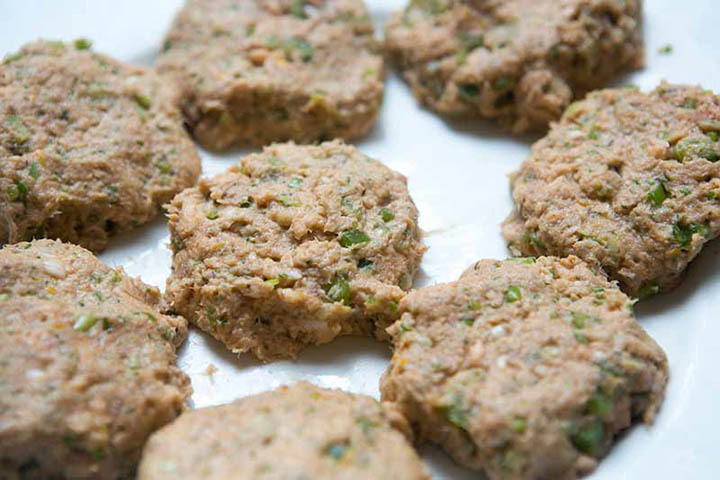 - You can also replace the onions with scallions, to give the patties a stronger flavor. - If you’re not sure how to serve your patties, you can always add a side salad. As the freshness of the greens will go great with the taste of the salmon. As you can see, both the patties and the sauce are not only delicious but also ridiculously easy to make. It will take you less than an hour to have an entire meal ready for you and your family even if you make the sauce from scratch. Did you like this article? Is there something missing? 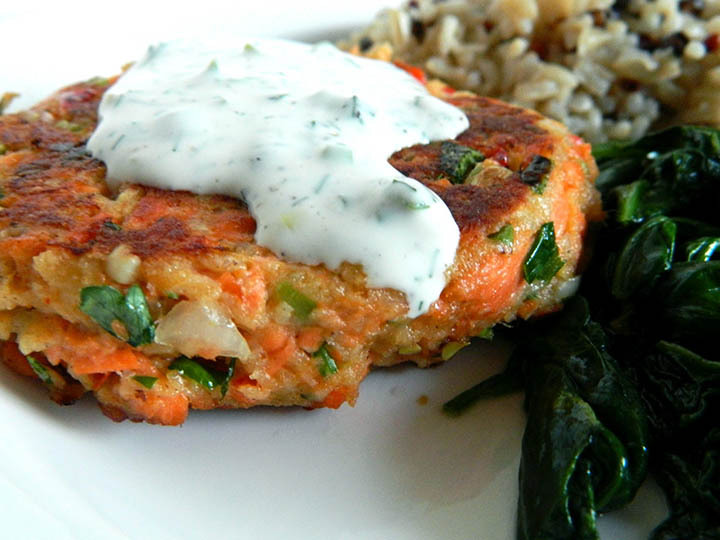 Do you know an easier way of making salmon patties or a better way of making the garlic sauce? If so, leave a comment! I’d love to hear from your experience.